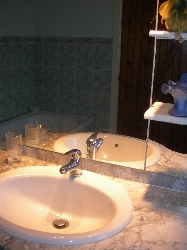 Petit Rohese, Country Cottage, pool, fully s/c for 4. Lounge with french windows onto terrace. This beautiful beamed Cottage was originally an old Prune drying Barn, and sleeps up to 5 people. 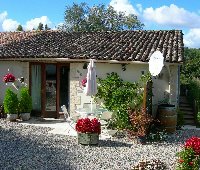 Situated in Park-like grounds in the heart of scenic French countryside there is a lovely pool with Roman steps and pool house. On the outskirts of small village and just a short drive from the historic Bastide town of VILLEREAL that has every commodity you could need for your stay. There are two double-on-suite bedrooms, tastefully furnished and decorated for your comfort, one with twin beds and a large shower on-suite and the other a double bed with bath on-suite. Both have ceiling fans for those hot nights, A single fold up bed can also be provided. 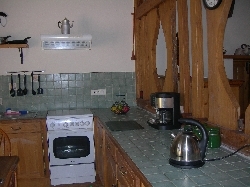 The fitted kitchen has a feature of a cow byre on one wall and is fully equipped for self-catering (fridge/freezer, cooker, washing machine, microwave, toaster etc.) with dining area. A really spaciouse lounge comfortably furnished, with vaulted beamed ceiling, has French doors that open onto a fantastic elevated terrace with lovely views. There is a flat screen TV (English free view TV/radio) with DVD and we have many you can watch should you so choose. The large terrace is partially covered and is equipped with garden furniture and plants for your enjoyment. From here you get the most spectacular sunsets, what better place for that evening glass of wine. There is easy parking on the property. The pool is beautifully situated to get the sun all day. There is a pool house with seating area and loungers and parasols etc around the pool. 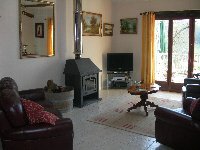 This lovely cottage is ony available for June, July, August & September. Parking on the property. Wifi free. 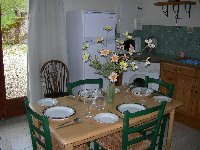 For that extra accommodation we have a cottage for 2 also, available all year. No.5774. 100� dicount for booking of 3 weeks or more.